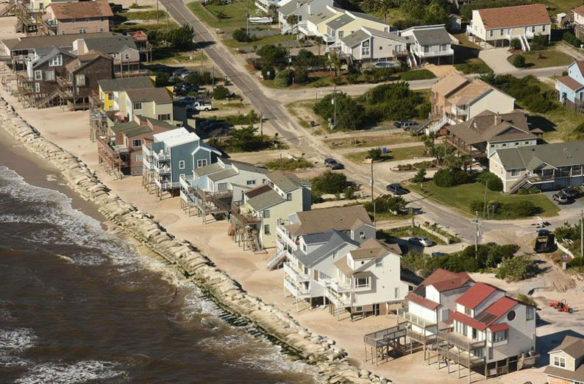 “A continuous sandbag wall on North Topsail Beach, N.C. shows the shore-hardening effect of such structures on beach loss, either by initial placement or by causing beach narrowing and loss.”—© William Neal, Orrin Pilkey & Norma Longo. Photo courtesy of: Ken Blevins/Wilmington StarNews. Building a road, a school, a bridge in Hampton Roads? Think about how long you want it to be around, and whether it might be underwater by then.